GABION PILLOWS are mini-sized gabion baskets filled with rocks that can be handled manually and without the need for heavy equipment. They are an ideal solution for do-it-yourself projects and retainer walls constructed in areas with limited space or remote access ... examples are back yard projects, ponds and river banks, eroded beach repairs, steep hillside protection, etc. Typical gabion pillows measure 3' x 1' x 6" deep and 3' x 1.5' x 6" deep weighing 150-250 lbs when filled with rock ... allowing them to be filled offsite and transported by pick up truck, garden cart or wheel barrow then stacked in place at the job site. 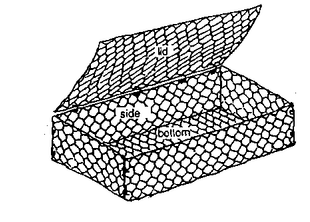 We offer these gabion pillows in galvanized, PVC coated and stainless steel welded wire or double-twisted woven wire mesh in galvanized and PVC coated steel or co-polymer marine mesh for salt water applications.